It’s Been 50 Years Since the British Invasion!! American music changed dramatically with the arrival of the Beatles in New York City on February 7, 1964. Although the British boy band had tried to gain this country’s attention the year before with songs like “Love Me Do”, “From Me to You”, “Please Please Me”, and “She Loves You”, their music had gone nowhere once released throughout the United States. However, the assassination of President John F. Kennedy had shaken American teenagers and left them feeling depressed, hopeless, and in a state of absolute shock, disbelief, and fear. With their cheeky sense of humor and catchy, upbeat pop songs along with their unusual style of dress and mop-top haircuts parents disliked, the Beatles seemed to be just what American teenagers needed to return to a state of normalcy. By the time they played their latest song, “I Want to Hold Your Hand”, on the Ed Sullivan Show two days later (February 9, 1964), it was clear that the U.S was struck by British fever and the doors swung wide open for additional British groups and individual singers. Some of the groups and singers that followed in the Beatles’ success included: The Who, The Dave Clark Five, Gerry and the Pacemakers, The Kinks, Petula Clark, The Zombies, The Swingin’ Blue Jeans, The Hollies, Manfred Mann, The Moody Blues, Lulu, The Mindbenders, The Searchers, The Troggs, Herman’s Hermits, Dusty Springfield, in addition to many, many others. For the next several years, these British musicians would dominate American music charts. In a nod to the 50th anniversary of the British Invasion, the Katharine Brush Library has put up a display of materials about these music groups on the second floor. 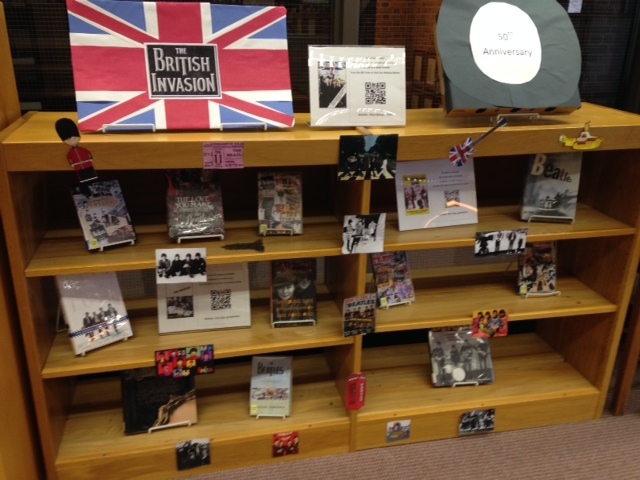 We invite you to scan one of the QR Codes with your smart phone to bring up one of the e-books we have in our collection on the topic, check out a hard copy book, or pick up a DVD about the Beatles! In the event that this is a topic of interest to you, we also want to mention that there is a Grammy Beatles special that will air on CBS stations on Sunday, February 9, 2014.